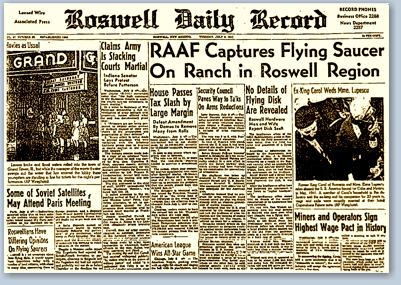 The Roswell incident is probably the most famous crash retrieval in the history of ufology. It is named after the town of Roswell, New Mexico, USA which is about 75 miles from the crash site and was the first town to receive news of the crash. The incident occurred in early July of 1947 at the onset of the Modern Era of ufology. Below is a brief summary of the events. On July 2, 1947 around 9:50 pm a UFO was seen traveling northwest over Roswell New, Mexico. That same evening another witness observed a bright meteor-like streak of light fall toward the northwestern horizon. At around the same time, a thunder storm in the neighboring vicinity of Corona was going on. During the storm, a ranch manager named Mac Brazel heard a loud explosion he described as something "different than thunder". The following day, Brazel and a boy named Timothy Proctor were inspecting fields on horseback when they came upon the debris of something that had crashed. The wreckage was concentrated in a an area a few hundred feet wide and about three quarters of a mile long. There were pieces of foil like material, small lightweight beams and a host of other larger and smaller pieces of debris. The material had odd properties. For example, although it was very light it could not be cut or dented and would not burn. Other pieces that were similar in appearance to aluminum foil could be crushed or folded, but when released would return to their original shape without any sign of a fold or crease. The debris field was concentrated enough that animals were spooked by it and would not cross it. Brazel and Proctor collected some of the pieces and took them to the Proctor farmhouse about 10 miles away. On July 6, 1947, Brazel drove into Roswell with some of the material where he visited the local Sheriff, who in turn notified the USAF. The next day, two USAF officers and Brazel visited the debris field and collected more samples. On July 8, 1947 the USAF issued a press release stating that they had recovered a flying disk and that it had been transported to Wright Field at Dayton Ohio. This was the location of the ATIC. By July 9th a full scale cleanup effort was underway and the USAF closed the area to civilians. A new press release was issued declaring that the disk had actually been a weather balloon. A local radio station that had been following the story was ordered to stop reporting on it. From then on the incident became classified under national security. A follow up by civilian investigators has yielded a number of accounts suggesting that the entire vessel did not come down at the initial location, and that a second crash site was discovered where the majority of the UFO and its injured occupants came to a rest. The official response to these claims has been persistent denial. In September 1994 the Air Force suggested that the debris may have been from a top-secret program called Project Mogul. This project used balloons to launch atomic bomb detonation monitoring equipment. The Mogul balloon explanation was never accompanied by any corroborating evidence and has been the subject of heated debate between skeptics and ufologists ever since. Ufologists currently appear to have the upper hand because there are no USAF reports that indicate a Project Mogul balloon had been in the sky at the time or that one had gone missing or crashed. Additionally, even if a Mogul balloon had been launched, weather records indicate that there was no wind at any altitude that would have carried the balloon in the direction of the crash site.